Classes require RSVP, fill out below. I understand I must attend with adequate food & vitamin supplies for the stay time or pay for supplies. DO YOU LOVE DOGS ? WANT TO BE A TRAINER? Foster Puppy Care Helper - Learn how to become a Foster Assistant Dog Care giver, in your home. Appleridge is currently looking for a Individual who has a strong desire to learn to be a trainer of Service and Obedience, Agility and Sanctioned Dog events. Serious qualified inquires will receive the training skills required to do the job and a fair rate of pay. Upon completion of the Apprentice portion of this job ( you will be required to title one of our dogs) you will receive a full time position and pay increase. We are looking for a happy individual that enjoys working with pups, dogs and people. No former experience is required, however a individual with Veterinarian Technician experience or former kennel or competitive obedience experience, will be highly desired for this position. Appleridge offers Competitive Conformation - All Breed, All level too! We can train you with your registered dog, or ours.
" IN HOME " and completed by our family & qualified trainers at our residence, not a kennel or boarding facility. This allows for family interaction. Older Pups, Youth and Adults are trained with love and respect using Motivational techniques at our Cleveland TN facility. leave it command with any item. Will not attempt to eat or touch anything - indicated "leave it"
Mind -perfect manners, children plus other animals -NO jumping "off"
Heel. Heel on a loose lead. Heel from motion, will be started. Baby dogs will happily keep the leash mostly loose as they learn their "stay with me" skills. Heel speeds-fast, normal, slow, step by step and stairs will be introduced. yard and potty breaks on leash in public or loose in your yard. All 3 regular puppy baby dog vaccines completed. Your baby dog will be worked with by our children, which will help the pup to understand that little people may train differently than adults. Exposure to our young children will help your pup throughout life, with respecting and accepting children. This exposure is critical in the first 16 weeks of a pup's life. Appleridge Angel Dog program prepares your pup for the CGC. This level will set the stage for proper manners and obedience. Angel puppy training also covers the listed CGC requirements. The Advance (12-16 week course) will complete the CGC requirements to pass a Evaluation and Title your pet as a Canine Good Citizen. The CGC Program teaches good manners to dogs and responsible dog ownership to their owners. The 10-step Canine Good Citizen test is a non-competitive. The CGC award is a prerequisite for many therapy dog groups. prep training for your pup to sit directly in front of you, after completing a come to you. Heel. Heel on a loose lead. Heel from motion. yard and potty breaks on leash away from home or loose in yard. Trained in English. German, by request. A training video and manual will accompany. Adoption cost will include all of his shots completed including rabies and worming. Documented. working towards a BN preparation to title, please see Video page to see a trial being completed. Your Advance trained puppy at Appleridge will be able to complete the tasks required to successfully complete the AKC CGC evaluation. Your pup will be presented to a CKC approved CGC Evaluator for its accreditation and title opportunity. You may wish to attend this evaluation and participate in the final positives steps in parenting your new family companion into the community or your home. For Advance Trained pups, the Community Canine is the next step to proving the quality of training your dog has, incredible manners and excellent community minded instructions that they will happily follow. Level 3 introduces your pup to the CGCA. Most pups will pass this evaluation by 20 weeks, however, each pup is unique and settles into adolescence differently. 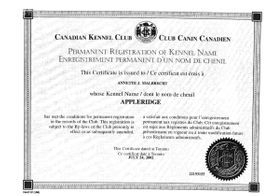 Appleridge will assist you in making the right decision for progression for you and your dog when it's ready. Level #4 completion may be more appropriate for most adolescent GSD to be evaluated for their CGCA. Your pup MUST have passed a AKC CGC to be considered for CGCA. Walks on a loose leash in a natural situation (not in a ring) -- does not pull. Dog walks past distraction dogs present; does not pull. Sit -- stay in small group (3 other people with dogs). Dog allows person who is carrying something (backpack, computer bag, etc.) to approach and pet it. "Leave it." Dog walks by food and follows owner instructions, "Leave it." Down or sit stay -- distance (owner's choice). Dog is on 20--ft line, owner walks away with back to dog, picks up an item (e.g., backpack, training bag, clipboard, folder etc.) placed on the floor/chair/ground by the evaluator and returns to the dog. Recall with distractions present (coming when called). Handler goes out 20--ft. **(off center) and calls dog. Dog is on the 20--ft. line from #8 above. Dog will sit or stand stay (owner's choice) while owner enters/exits a doorway or narrow passageway. Owner calls dog through door when ready. the owner may choose to have the dog go through the doorway at the owner's side. Whichever method is used, the dog must not pull the owner and must be under good control. Think of the handler having the leash in one hand and a cup of coffee in the other. Doorway or gate can be real or simulated with ring gates, two chairs, or a natural passageway (e.g., entrance to trail) in the community. This stage lends a new challenge of adolescent behaviors. Each dog, reacts differently. All Service dogs are recommended spayed and or neutered at 6 months. Competitive Obedience dogs are now eligible to compete at AKC Sanctioned events. Polishing is critical at this phase. We become very black and white with training commands now. It's Right or it's NOT. Distraction training - out of site. Items of value will be placed on the floor, counters, everywhere as a test to determine that your dog can and will " leave it" despite you being absent from the room. Distraction with activity. Your dog shall remain in a calm and controlled manner while toys, balls and even dogs run about them playing, walking or running. We will also expect this type of control in an off leash down stay and sit stay with the handler 30 feet from the dog. Down stay shall be performed with distractions for a period of 5 minutes with handler at a distance of 30 feet. Sit stay shall be performed with distractions for a period of 3 minutes with handler at a distance of 30 feet. Standing for Examination by a Judge, Vet, Groomer, Handler etc. Your dog shall stand calmly in a respectful manner, willingly, with a single command to stand, and then stay. Your dog will accept a physical examination from an individual as per instructions to remain in a " stand stay" with the handler at a 6' or great distance without showing resentment, anger or shyness to the examiner. Exit/enter doorway with no pulling in dog-friendly buildings. Exit building to start test, additional Public buildings items are below. Tolerate distractions (people wearing hats, coats, men, women, etc). Noises: horns, sirens, construction noise, etc. Person walks up and pets the dog. May be carrying an item such as a small dog in a bag, a computer bag, etc. Person does not put the bag down to pet the dog. Stairs, steps, or elevator under control. To pass the CGCU test, dogs must pass all 10 items of the test. 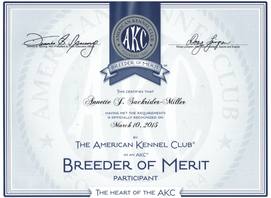 complete a BN or RN AKC title, which will be included on their official AKC registration papers. I am prepared to pay the additional $1000.oo USD for the official title over and above the cost of the training. This process will be completed and tested by 2 or more judges, for 3 completed "legs" of which your dog will achieve a 85% or greater score out of the 200 points achievable, with a least 50% of the points in each task part of the testing. Not an easy task for a young dog or inexperienced handler. This title is so rewarding. It is a wonderful thing to achieve for you or any dog you own. Level # 5 - Advance Companion Dog Competitive Prepared & Rally Novice ready. complete a CD ( Companion Dog) AKC title, which will be included on their official AKC registration papers. I am aware that the cost of the CD is $1000.oo USD and that the BN must be completed before I can acquire the CD, through Appleridge training program. 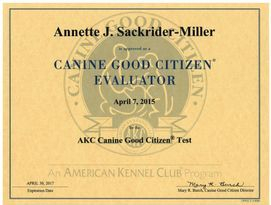 I am using my dog as a Service dog and feel the documented AKC title will benefit me and my dog. I am a breeder or pet owner that wishes to have my dog highly trained. This title is so rewarding. It is a wonderful thing to achieve for you or any dog you own. Life will never be the same for your companion team. Heel on leash at a regular pace, slow pace, fast pace at a instants notice without verbal instruction professionally, like changing gears in your car. Heel - figure 8 - in either direction at the handlers pace, with the dog speeding or slowing to accommodate the handler without bumping, forging, lagging or encroaching on the handlers space. Sit from Motion. In or during any walk or heeling exercise, including coming to the curb or sidewalk crossing, my dog will sit automatically, without my asking. It will remain calmly and quietly in a sit until I start walking. Stand off leash for public examination. This exercise will be done with a single command to stand, then stay in the stand position, without a leash while the handler goes 6 feet from the dog and commands the dog to stay for a individual to touch, talk to or brush over the dog. The dog may not move, sit, be aggressive, aloof, or leave the stand position. The handler then returns around the dog to the heel position to release the dog. Off leash Heel. The dog and handler shall HEEL off leash together at a normal, fast, or slow pace changing directions which includes a right, left and about turn. Flawlessly the team must work together to show complete control of the dog. In this exercise the team must halt from motion with a instant sit from motion, without command. Off leash recall. The dog will be left in a " sit, wait" position at one end of the field or building. The handler shall leave the dog competently by turning and walking away. 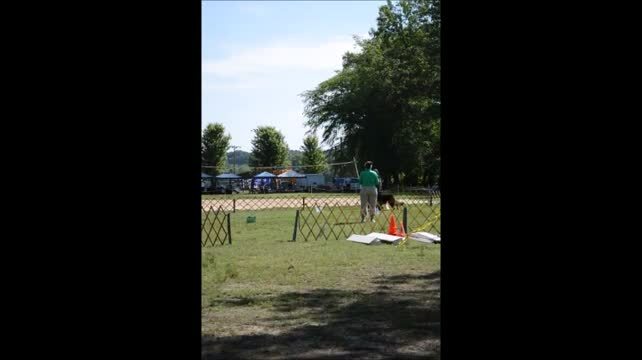 Once at the other end of the ring, building, or field, the handler is asked to call their dog. The dog shall run briskly to the owner and sit itself directly in front of the owner, facing the owner, waiting for further instruction. The handler then asks the dog to come to a Heel position. The dog must briskly bring itself to the left side of the handler in a sit position even with the handlers legs. Sit Stay - This test requires the Handler to ask the dog to sit, without food, or incentive or physical force. The dog will be in a group with other dogs of any breed, in close proximity. The dog will sit on command, then calmly, quietly and professionally remain in the sit without a leash, while the handler goes briskly (without extra commands, looking back or any other instruction) The handler shall turn and face their dog from across the ring, field, or building. The handler shall remain in a standing position for 1 minute, or until told by the judge to return to their dog. The handler will quickly return, around the back of their dog ( who must remain in the sit-stay). Once in the heel position, the judge will instruct the group to finish the exercise. Down Stay - This test requires the Handler to ask the dog to down, without food, or incentive or physical force. The dog will be in a group with other dogs of any breed, in close proximity. The dog will down on command, then calmly, quietly and professionally remain in the down without a leash, while the handler goes briskly (without extra commands, looking back or any other instruction) The handler shall turn and face their dog from across the ring, field, or building. The handler shall remain in a standing position for 3 minutes, or until told by the judge to return to their dog. The handler will quickly return, around the back of their dog ( who must remain in the down-stay). Once in the heel position, the judge will instruct the group to finish the exercise. 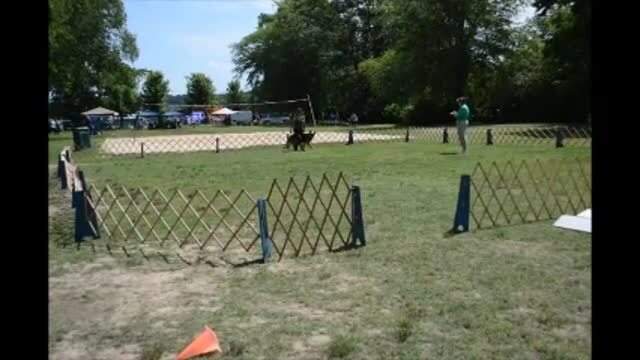 This process will be completed and tested by 2 or more judges, for 3 completed "legs" of which your dog will achieve a 85% or greater score out of the 200 points achievable, with a least 50% of the points in each task part of the testing. Not an easy task for a young dog or inexperienced handler. This title is so rewarding. It is a wonderful thing to achieve for you or any dog you own. Life will never be the same for your companion team. Assistance Dog Preparation Training is offered to Disable Individuals at a reduced cost and we are always happy to work with your Insurance Company or Public Group Donation programs to help you get the Dog that will give you the Assistance, Freedom or Emotional Support that you are looking for. Your Guardian Angel training program will be unique and there for details of your need will be required to ascertain the time frame and level of training required to bring your new companion to the level of which you require. We do ask that you plan ahead and be patient as things don't just happen over night. There may or may not be a pup or dog available immediately when your need arises. We do have the expertise to train you and your dog to Rally, Agility, CDX, UD, OTCH, Herding and more. Time is so precious for us and therefore we cannot offer dogs trained to that level at a $ value. Classes for all Appleridge dogs are no charge, life long at our facility. Plan on learning those advanced skills so you and your dog can attend trials and share life to the fullest.